Not all the fun at Walt Disney World is found in the parks. 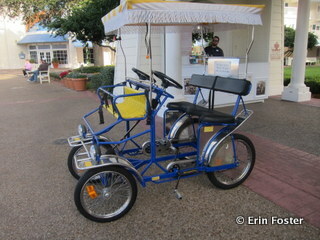 A nice alternative form of recreation are the surrey bike rentals found at many of the moderate and deluxe resorts. Here’s what you need to know about renting a surrey. Let’s start with the basics – what exactly is a surrey bike? Surrey bikes are multi-person pedaled conveyances. They look a bit like a golf cart, but powered by humans rather than a motor. How many people can a surrey bike seat? Disney offers different sizes of surrey bike rentals. Some are one-bench bikes built for two pedalers, some are two-bench bikes built for four pedalers, and some are three-bench Grand Surrey bikes built for six pedalers. You can actually fit several more people on the bike than the number of pedalers. The bikes all have a front basket area which seats up to two small children, up to about age six or seven depending on their height. Additionally, each main bench seat of the bike can fit two adult-sized pedalers, plus a child or small adult. When my three children were small, we could fit our entire family of five in a two-pedal surrey bike. Now that my children are all teens, we would need a four-pedal bike. My fellow Moms Panelist Darcie once got a total of ten people (which included several small children) on a three-bench bike. Small children can sit in the front basket area. Where can I find these bikes? 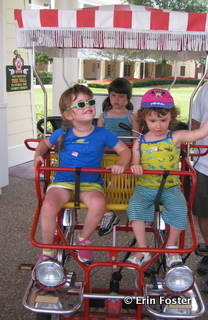 Surrey bike rentals are available at the Boardwalk, Wilderness Lodge, Saratoga Springs, Old Key West, Port Orleans Riverside, and Caribbean Beach resorts at Walt Disney World. Additionally, they may be available seasonally at the Coronado Springs resort. Do I have to be staying at one of those resorts to rent a surrey bike? Nope. Anyone is welcome to rent the bikes. There is no requirement that you be staying at a particular resort or even at a Disney hotel. For example, if you’re staying off site but having dinner at a restaurant on the Boardwalk, a surrey rental there can be a fun way to end your evening. Are all the surrey bike sizes available at all locations? No. Most locations only have the one and two-bench bikes. Grand Surrey may only be available at the Boardwalk. If you have a large party and all want to ride together, the Boardwalk is the place to go. Are there any pros or cons to a particular rental locations? There’s not much difference, you should really select based on your location. I will mention that the path available to renters at the Boardwalk includes a small hill in near the bridge by the Swan and Dolphin hotels. When you’ve got two wimpy adults pedaling themselves plus three medium-sized kids, that hill can feel like Mount Everest. The surrey bikes enticing for my kids, are there age requirements for renting a surrey bike? Can they rent one themselves? Guests must be at least 18 years old to rent a surrey bike and are required to show ID proof of age. So while children are welcome to ride on the surrey bikes, they can’t do this unsupervised. Guests must be at least 21 years of age to rent surreys at the Boardwalk after 8:00 p.m.
Can my kids pedal the bike? The pedals are a fair distance away from the seat. Everyone who pedals must be at least four and a half feet tall. Again, children can be passengers, but they won’t be able to pedal unless they’re tall enough. The bike paths are clearly marked. Do we have to wear helmets when riding? Helmets are not required for any surrey bike riders. 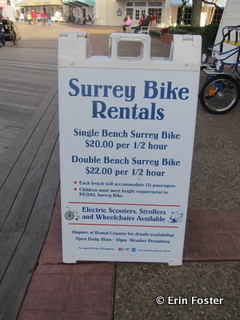 However, many of the surrey rental locations also rent standard bicycles and have helmets on hand. If you feel more comfortable having you or your children wear helmets, you’re welcome to ask to borrow some. Can I make a reservation for a surrey bike? No, surrey bikes are rented on a first come, first served basis. In my personal experience, availability is not usually a problem. I’ve rented surreys half a dozen times and never once had to wait. What’s the experience like? Are they hard to pedal or control? I wouldn’t say it’s hard to control the surrey bikes, but it certainly is a different experience than controlling a regular bike. You have to plan a few seconds ahead and be deliberate with your actions. Additionally, the added weight of the surrey means you’ll need a longer brake time than with a standard bike. If you’re on a flat surface, the surreys are not difficult to pedal (other than on the Boardwalk hill I mentioned above). I will say that this can be actual exercise. If you’re a guest prone to shortness of breath or related medical issues, you may want to think twice about undertaking this activity. Can I take the surrey bike anywhere I want? Not really. There are specific surrey bike routes that are allowed at each rental location. 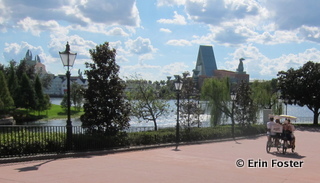 For example, the Port Orleans Riverside rentals are not allowed to venture into Port Orleans French Quarter. The route will be explained to you when you rent the bike. Are there specific hours for the surrey bike rentals? Yes. The hours vary at each location and may further vary seasonally. Most resorts rent surreys from late morning until about 5:00 p.m. The rentals at the Boardwalk typically start mid-afternoon and end at about 10:00 p.m. For exact hours, stop by the concierge desk at your hotel. How much time will I want the bike for? Is half an hour enough? The bike paths at the surrey rental resorts range from about half a mile to a mile. For example, the path around the Boardwalk resorts area is .8 miles long. During a typical half hour rental, you could make this loop at least twice. That’s usually enough for most guests. How do I pay for the surrey bike rental? Can I use cash or add it to my room charge? At most surrey rental locations you can use cash, credit cards, Disney room charge, or Disney gift card. The Boardwalk location sometimes has postings that you can only use cash or credit cards there. Surrey bike rentals are included with Disney Dining Premium and Platinum Recreation Plans. A pleasant way to pass the afternoon at the Boardwalk. Is there any particular dress code requirement for surrey bike rental? All guests on the bike must be wearing shoes. Loose clothing, or anything else that might become entangled in the bike chains, is not recommended. Avoid wearing long dresses or baggy pants when riding. Consumption of alcohol is not permitted when riding the surrey bikes. Guests should not leave the bike unattended at any time. How does weather impact surrey bike rentals? The rental stations do close in adverse weather conditions. If it’s pouring, don’t expect to be able to rent a surrey. 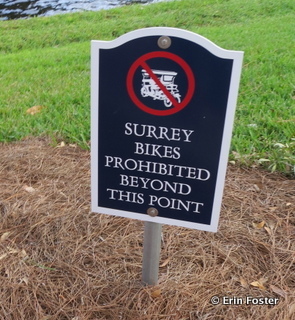 Surrey bike rental can be a great activity for a non-park day or if you arrive at Walt Disney World during the afternoon and don’t want to start your park touring until the next morning. 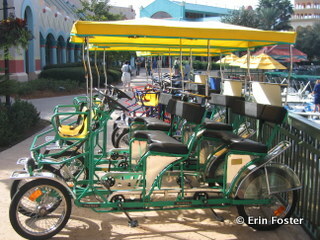 Have you ever rented a surrey bike at Walt Disney World? What was your experience? Was it worth the money? Would you do it again? Let us know in the comments below. Note: Never pedal backwards. Passed some animals on the trail and wanted to back up to see them better. Bad idea. I peddled backwards and my wife got her foot stuck in the pedals (painful). They will tell you not to pedal backwards before you get going, but just an extra word of warning: Please don’t ever do this. Good tip. Thanks for the reminder. We rented a 2 peddler at the Boardwalk several years ago and put our two boys on the handlebar seats. I can tell you that it’s quite a workout, especially crossing the bridges on that route! If you do rent one, be prepared to sweat. I agree. We’ve rented at the Wilderness Lodge and had no problems at all, but that Boardwalk loop hill can be a killer. We rented a 2-bench Surrey at Port Orleans Riverside last August. My hubby and I rode up front and my two kids (12 and 10 years old) rode in the back. My 10-year old daughter pedaled a little bit but she`s small for her age and struggled a bit to get the pedals fully around 🙂 But she was quite happy to just come along for the ride. My 12-year old son had no problems at all joining in. The trail along the Sassagoula river was beautiful and we had so much fun. A half hour rental was enough time to do the whole trail and make it back to the rental stand. We would most definitely rent a Surrey again, hopefully at the Boardwalk next time! We did this at Caribbean Beach in 2009 — with a 6 and 9 year old. It was my husband’s favorite part of the whole vacation. It was MY least favorite part. It was hot. It was sweaty. It was HARD!!!!!!! 🙂 It wasn’t my idea of a vacation activity, but everyone else thought it was very fun. As I recall, the Caribbean Beach path was quite pretty. I’d do it as early in the day as possible!!!! I thought this might be a fun activity to do after Epcot and then get ice cream, but you have to be at least 21 after 8 which I don’t think is fair. I will be just short of 20 years old on our next trip and it’s not like you encounter anything adult. Still, visiting the Boardwalk and trying the bakery will be fun.